This statement, which we reaffirm at each Sunday service in South Strafford, says most succinctly what our Church is all about. 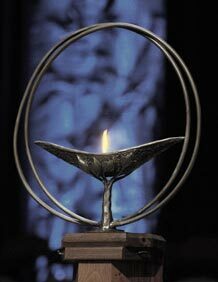 The flaming chalice is the best-known symbol of Unitarian Universalism. Lighting the chalice is part of every service. The two faiths from which modern Unitarian Universalism developed were both heresies. Unitarians denied the Trinity and asserted the oneness of God. They believed in following Christ but not worshipping him. Universalists believed in a God of love. They denied Calvinism’s doctrines of original sin, damnation, and salvation by faith; everyone is forgiven by a loving God. • Respect for the independent web of all existence, of which we are a part.